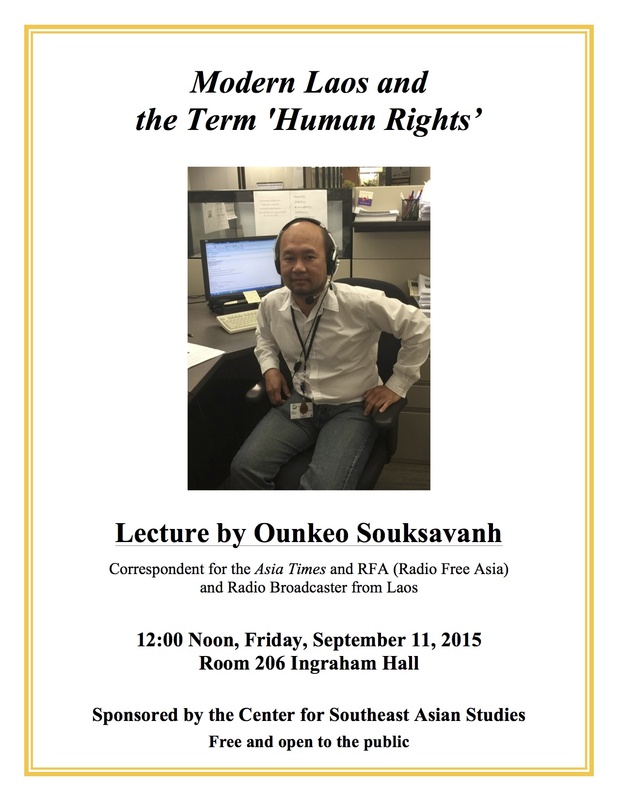 Ounekeo Souksavanj, Correspondent for the Asia Times and RFA (Radio Free Asia) and Radio Broadcaster from Laos, will be giving a lecture on Friday, September 11. In its rush to make the country modern, the Lao government often proceeds without adequately considering the social and environmental impact of development efforts and the consequences faced by local people, including land grabbing. These circumstances are also linked to the detention of some Lao people in relation to land conflicts with investors, and the disappearance of Sombath Somphone, a leader of Lao civil society, on December 15, 2012. In this presentation, Mr. Souksavanh explains the present situation in Laos, including the way the term “human rights” is used in the country, and how it relates to development efforts. This lecture is sponsored by the Center for Southeast Asian Studies and is free and open to the public.